Who's (Still) Above the Social Security Payroll Tax Cap? The Social Security payroll tax cap is the earnings level above which no further Social Security taxes are collected. The cap is currently at $110,100, though legislation has been introduced in Congress to apply the Social Security payroll tax to earnings above $250,000 (but not between the current cap and this level). This issue brief updates earlier work, finding that 5.8 percent of workers would be affected if the Social Security cap were eliminated entirely and 1.4 percent would be affected if the current tax were applied to earnings over $250,000. It breaks down these numbers further by gender, race or ethnicity, age, and state of residence. 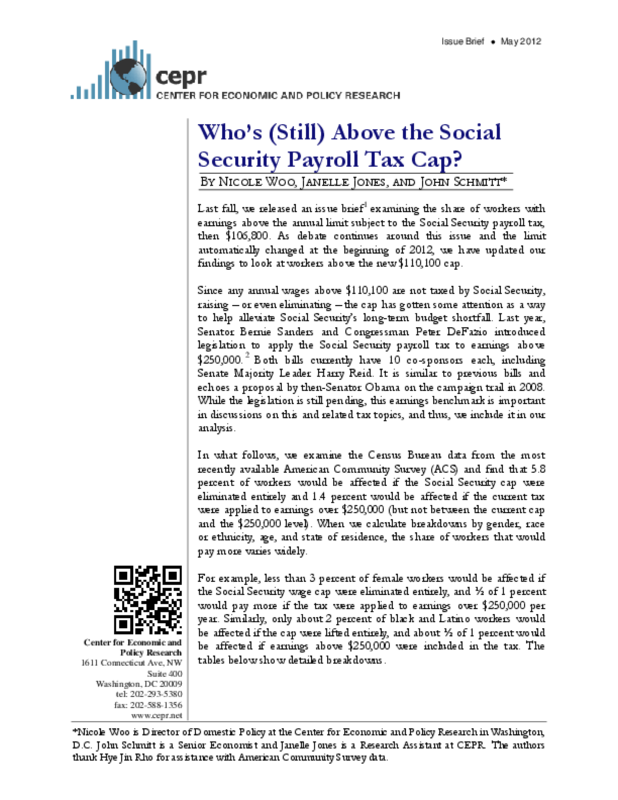 Title: Who's (Still) Above the Social Security Payroll Tax Cap?